If you held on to your original Harry Potter books with the hopes that they'd be worth something down the road, now's the time to break them out of storage. Certain copies of J.K. Rowling's Harry Potter series could net you more than $50,000, according to Mashable. The online rare book sellers AbeBooks recently published a list of Harry Potter editions that are considered especially valuable today. One major indicator that your book is a collector's item? A signature from Rowling herself. Signed first editions of books from later in the series could earn you up to four figures, as Rowling signed fewer copies as she became more successful. According to AbeBooks, UK first editions of Harry Potter and the Philosopher's Stone are considered the "Holy Grail." Only 500 were ever printed, and 300 of those were donated to libraries. If you own a copy of one of these first books that lists Joanne Rowling as the author on the title page instead of J.K., then you could be sitting on a collector's item worth between $40,000 and $56,000. 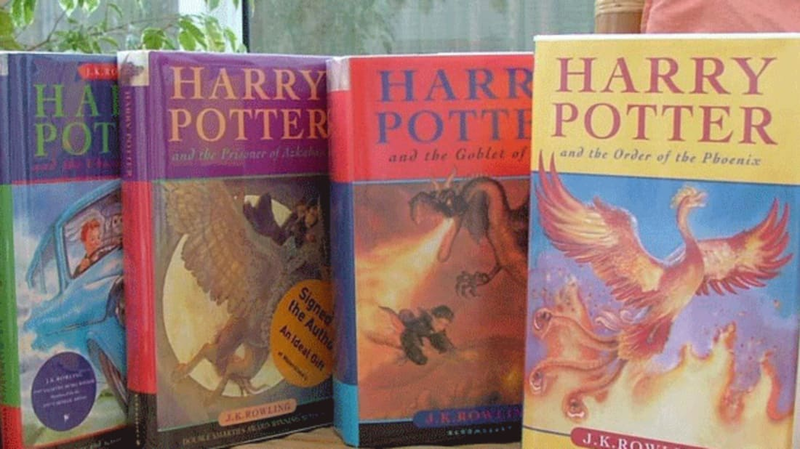 UK first editions of the early books and U.S. first editions of Harry Potter and the Sorcerer's Stone can all be expected to fetch thousands of dollars for those willing to sell them. You can check out the full "Guide to Collecting Harry Potter Books" at AbeBooks.